Thank you for your interest in the Michigan Animal Adoption Network (MAAN) and Animal Care Network (ACN)! All of our operations can only be successful through volunteer efforts and donations. We are always looking for both. Please fill out the form and return by either mail or email. The Animal Care Network is an outreach program consisting of teams of volunteers who visit low income areas in suburban Wayne and Oakland counties each weekend to provide supplies and attention to strictly outdoor animals who have been neglected. We are looking for volunteers able to cope with the often harsh conditions we see. Most of these animals spend their entire lives outside, often under less than ideal conditions. ACN volunteers visit approximately 10 to 30 locations each weekend and are there to provide doghouses, clean straw, fresh food and water in clean bowls, tie-out chains, collars, and a little attention to animals and owners in need of assistance. ACN visits are not always pretty, and volunteers have encountered some heartbreaking situations. 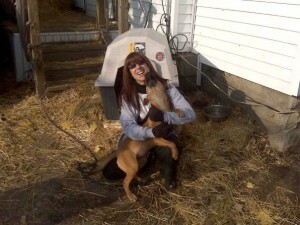 But knowing that they are easing an animal’s suffering is all volunteers need to keep going. We also work to educate owners about proper pet care and have developed an aggressive spay/neuter campaign in these areas. If you have a few hours each week or each month, this program could be right up your alley! Call 248-545-5055 to learn more about volunteering. IMPORTANT: Only our weekly team activities in Pontiac and Inkster and other specifically designated ACN activities will be considered authorized ACN activities. Unauthorized ACN activities will result in immediate dismissal of the volunteer from both the ACN and MAAN. Throughout the year, we have bowling events, Texas Hold ’em fundraisers and food drives. We always need volunteers to help us make these events a success! Please contact Lindsay Warren if you would like to help with any of these types of events. Please consider offering your volunteer services.We always need your assistance and you’ll be incredibly rewarded for your efforts. Please read over our Volunteer Liability Waiver (above). Print then complete the form and either email it to us or send it to our PO Box. The return of the completed waiver is required in order to volunteer for us. If you have any questions, please feel free to call our office at 248 545-5055. We know we can’t save them all, but we can make a difference for the animals that do touch our lives each day.